IT Cosmetics’ New Year, New Conﬁdence in Your Skin! 5-Piece Collection gives you the power to reveal your most beautiful skin! This Today’s Special Value® is scheduled to debut on QVC® Saturday, January 13, 2018 at midnight (ET) and will be oﬀered for one day only! Each day, QVC picks one special item they believe shoppers will love, and oﬀers it at an exceptionally low price from midnight (ET) until 11:59 pm (PT) that day. Inside the collection: This exclusive ﬁve-piece collection features new Conﬁdence in an Eye Cream to help color correct and brighten the look of the eye area, plus Conﬁdence in a Cream to hydrate and improve the appearance of your skin. Also featured is Conﬁdence in a Compact, IT’s ﬁrst-ever solid serum foundation. Apply it eﬀortlessly with the included Heavenly Skin Skin-Smoothing Complexion Brush for your most ﬂawless-looking, airbrushed application. 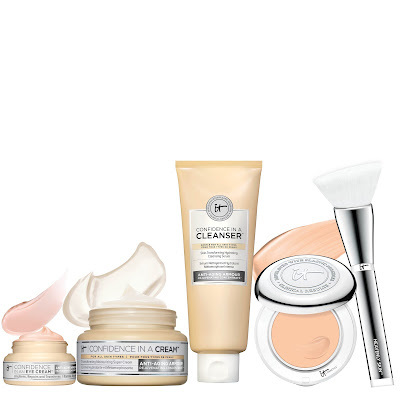 Conﬁdence in a Cleanser completes your collection and gently melts away dirt, oil and even long-wear eye makeup! Shop IT on QVC Tune in to QVC on January 13, 2018 at 12 am, 3 am, 7 am, 2 pm and 7 pm ET for more details on the New Year, New Conﬁdence in Your Skin! 5-Piece Collection. The price for this set is $79.96 plus $3.00 for shipping/handling. NEW! Conﬁdence in an Eye Cream Transforming Moisturizing Eye Cream Make tired eyes look instantly more awake with this anti-aging, moisturizing eye cream. Your game-changing essential features an exclusive apricot tint to counteract the appearance of under-eye darkness, and it’s infused with skin-loving collagen, peptides and hyaluronic acid! Customer Choice® Beauty Award Winner! Conﬁdence in a Cream Transforming Moisturizing Super Cream Great skin starts with conﬁdence! Perfect for all skin types, this best-selling super cream hydrates for soft, supple skin. In a consumer use survey, 81% of respondents somewhat to strongly agreed pores appeared minimized and ﬁne lines and wrinkles appeared less noticeable. The formula can be used as your a.m. and p.m. moisturizer and utilizes cutting-edge, anti-aging technology to help improve the appearance of your skin. Customer Choice® Beauty Award Winner! Conﬁdence in a Compact with SPF 50+ Skin-Transforming Full Coverage Solid Super Serum IT’s ﬁrst-ever anti-aging solid serum foundation! Infused with pure color pigments and SPF 50+ broad-spectrum sun protection, this revolutionary formula is your skincare, full-coverage foundation and SPF 50+ sun protection all in one simple step. The groundbreaking solid serum technology combined with ceramides, hydrolyzed collagen, hyaluronic acid and squalane help to give you the look of your most youthful, ﬂawless skin! Conﬁdence in a Cleanser Skin-Transforming Hydrating Cleansing Serum Experience this revolutionary one-step skincare solution that cleanses and moisturizes while leaving your skin feeling soft and refreshed. Suitable for all skin types, this sulfate-free, soap-free cleanser contains ceramides, hydrolyzed collagen, peptides, hyaluronic acid and colloidal oatmeal. It instantly removes makeup! Heavenly Skin Skin-Smoothing Complexion Brush Your skin will thank you for it! This breakthrough brush features unique Heavenly Skin hair, and its custom-cut brush head does the work for you, hugging the natural contours of your features for eﬀortlessly airbrushed coverage. It pairs perfectly with your Conﬁdence in a Compact! Products provided courtesy of IT Cosmetics for editorial consideration.